Disclaimer: It’s important to note that some of the dishes contain ingredients or use cooking methods that some of you might not be comfortable with. This is just an informative piece to introduce you to local food culture. Like our other articles, we carefully curate and share with you the local stories to help you see Thailand like Thais do. Fried silkworms, scorpions and crickets are among the most common weird Thai food that make it into travelers’ bellies and to travel blogs. In reality, these creepy-crawlies make up only small part of the exotic Thai food sphere. Before you say nothing is going to surprise you anymore, check out our list of weird Thai food that many locals (and some travelers) love. Yes, pork brain is edible and this weird Northern Thai dish requires some courage. Seasoned with Kapi (shrimp paste), lemongrass, lime leaves, dried chilies and other Thai herbs, the pork brain is then wrapped in banana leaves and grilled or roasted with low heat. Most locals roast pork brain on traditional Thai stove as the coal gives the dish an earthy aroma. Again, we acknowledge that eating live animals is not for everyone. We aren’t encouraging you to try, or not to try the dish. The live shrimps used in this Isan (Northeastern Thai) dish are the tiny translucent ones called krills. They are seasoned with fish sauce, lime juice, sugar and chilies. Sometimes pickled fish is also added. Since the shrimps are still alive, they literally jump and dance, hence the name. Red ant eggs are particularly popular in Northeastern Thailand. These crunchy eggs are eaten both raw and cooked. The most common dishes with ant eggs include spicy salad with herbs or fried omelet. Today ant eggs are considered rare and expensive ingredients despite a growing number of ant farms. Unexpectedly similar to chicken meat in taste and texture, the amphibian also goes through the same cooking method – deep fry with garlic. Braised chicken feet is often paired with noodles or steamed rice. The dish is a real slow food, as it takes hours for the meat to absorb the condiments, and one long sitting to nibble at the succulent feet. Another weird Thai food made with pig parts. The northerners fuse raw pig blood with lemongrass to ease out the meaty tang. The soup also contains herbs, spices, raw pig kidney, fried pig innards, and fried rice noodles. The crunchy and chewy horseshoe crab roes have long been popular among Thais, especially the northeasterners. The most common cooking method is to season the roes with typical condiments for sour and spicy salad. 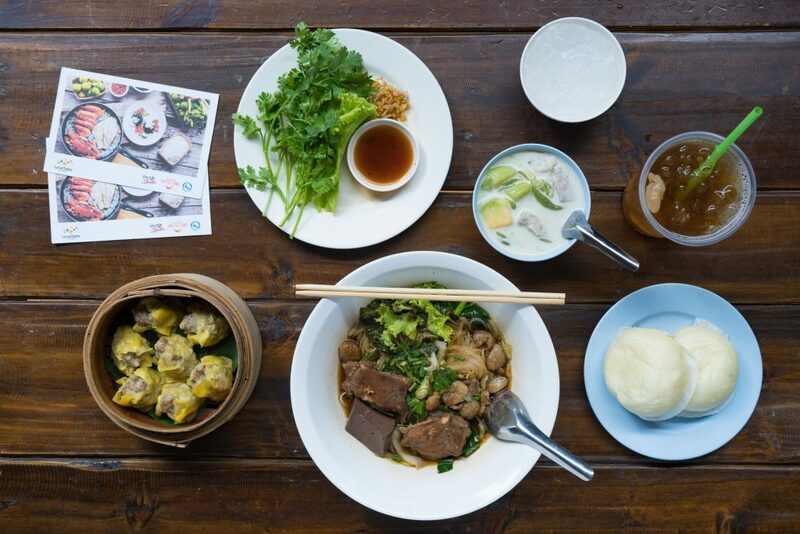 At first glance, Khao Ngiao might not look like what you would consider weird Thai food. At first bite, Khao Ngiao might not taste weird either. However, the dark purplish brown rice is actually steamed with pork blood. 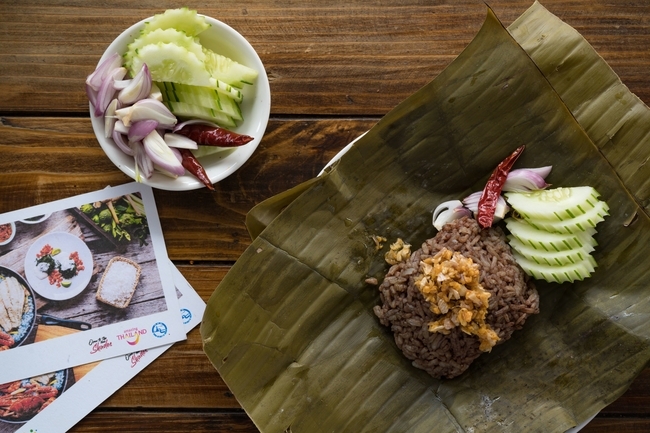 It’s among the rarer Northern Thai dishes and usually served wrapped in banana leaf. This local restaurant in Lamphun serves Khao Ngiao. You read that right. Lamphun locals actually add longans (the city’s signature fruit) to noodles and the sweet fruit doesn’t clash with braised pork or soup. However, you can also eat Longan Noodles dry. Other longan dishes in Lamphun include Sticky Rice with Longans and Longan-Filled Steamed Buns. This local restaurant in Lamphun serves Longan Noodles.